Summer vacation may be winding down, but with the beautiful weather most kids are still in full summer-mode. Having put all thoughts of school out of their minds as they took advantage of their days of freedom, returning to school can be a tough challenge both for them and you! 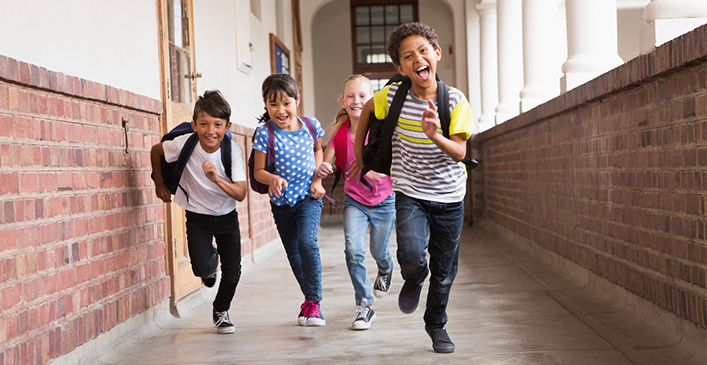 Whether they are moving to middle school or high school or are simply progressing to the next grade, the thought of returning can be very daunting and can make kids feel anxious. While some kids get naturally excited on their own about going back to school, as parents there are steps you can take to make the transition easier if your kids aren’t as enthusiastic about the summer ending. Some extra through and preparation will ensure your child gets off to a great start this school year. If your child is moving up a grade and has made some friends, you could arrange playdates with them. Playing with the right friends can increase self-esteem and confidence in kids and can develop their imagination. They will feel more confident when they go back to school after having had a subtle refresher of the buddies that know them well and will look out for them. Even if your child is moving up to middle or high school, the company of peers is important. If they are sporty, perhaps encourage them to get their friends together for a friendly game of their choice. If they are not fond of sports, other activities such as attending a club or event relating to their interests with their friends could be encouraged. They could even check out and chat about the latest blockbuster movie together. If you have a younger child, you may have got in the habit of doing little things for them such as tying their hair back or fastening their shoe-laces. While doing these things for your child can save a lot of time, especially when you are getting ready for school in the morning, you are not always being helpful in the long term. If you allow them to do these smaller tasks unaided, it’ll encourage them to be more independent. When they go back to school they may feel awkward and silly if they have to ask an adult to help them, especially if they are not blessed with a teacher with an understanding temperament. They can also feel left behind if their peers are coping well with these tasks unaided. Even with older children, simple tasks such as getting their own clothes ready for school or checking they have the right supplies for the right subjects themselves should be encouraged. It is likely your child will be used to getting up later than they do for school over the summer break. To suddenly go from this to a routine where they have to get up much earlier can be a shock to them. To avoid this it is sensible to cut down their “later to bed, later to rise” sleeping pattern. Aim to get them into the sensible habits they were in before the start of summer vacation at least a week before returning to school. One way to make your child feel happier about returning to school is to get them involved in the process. If they are going to a new school, make sure they are familiar with the location of the school and reiterate your transport arrangements. Consider taking them to have a look at the school from the outside during the break to instill a familiarity. When you are shopping for things your child will need for school, take them with you during the summer break. Picking out a new lunchbox or backpack together, for example, will make them feel more involved. It is important that you discuss any concerns your child may have about returning to school. There may be an issue troubling them that has an easy solution, but if they keep it to themselves they could get so anxious that they magnify it in their mind and make things worse. Make sure you take the time to chat with and listen to them. Although you won’t be physically there with them when they go back to the classroom, a good homelife can go a long way to making a child feel secure and confident. These are essential feelings for a smooth back to school transition.